On Saturday and Sunday I did some testing as part of my Sheiko program. On squats the max I did was 345 but that rep was high. The weight didn't feel terrible so next time I should be able to get it and I'll focus on hitting depth. For bench I did a solid rep at 305 with a pause at top and bottom. The previous week I hit a max touch and go of 315 so I tried for 320 but that wasn't in the cards at this session. 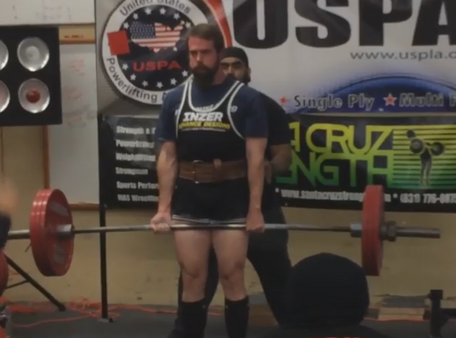 With this 305, though, I feel like I should hit 303 at my comp with no issues. For deads I continued with my block pulls to save my hips for the comp. I worked up to 430 with the hook grip. I then jumped to 455 and switched to mixed grip. Somehow I lost tightness on that rep and only lifted it a few inches. I decided to drop back to 445 and made that rep...it was a bit of a grinder but I locked it out. Now it's back to some sub-maximal tapering work leading into my meet.